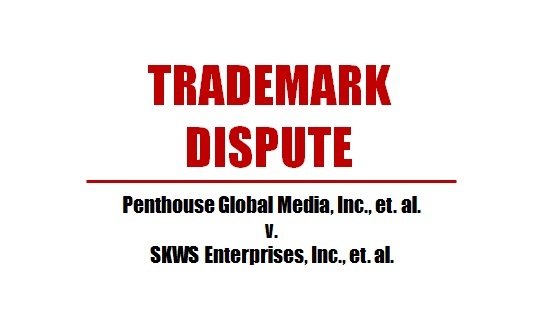 Last week, a trademark suit filed by Penthouse against the famed Factory Nightclub, in West Hollywood, was dismissed in light of the parties reaching a settlement. The complaint, filed on May 19, 2016 in the U.S. District Court for the Central District of California, alleged trademark infringement, trademark dilution, unfair competition, false advertising, and more. The complaint alleged that the defendants were notified repeatedly of their (alleged) infringement since 2014. The case was dismissed on Wednesday, November 16, 2016 in response to a stipulation executed by both parties based on a settlement agreement. I have not been able to find any reporting of details of the settlement. At the time of publication of this article, the domain, www.penthousewesthollywood.com points to a page that says “Account Suspended.” The complaint did mention that the defendants had stopped using that site in 2014. Interestingly, however, also at the time of this article’s publication, the domain, www.phwesthollywood.com points to a page with a logo that says “PH West Hollywood”. It says “SITE UNDER CONSTRUCTION” with an address of 661 North Robertson Boulevard in West Hollywood, an address of Factory Nightclub. I am curious as to whether Penthouse agreed to the defendants’ use of “PH” without the full term, “PENTHOUSE”. I say this because the domain including the full “PENTHOUSE” mark is suspended, while the one without the full mark is still up and running. In addition, the images shown in the complaint used “PENTHOUSE” along with “PH”, but “PENTHOUSE” is notably absent in the logo on the working website. 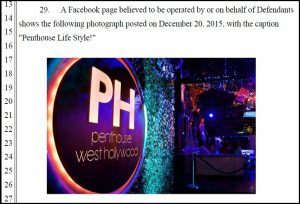 However, from a quick Internet search, I found a Facebook page up at www.Facebook.com/PHWeHo, which appears to be operated by the defendants (although I haven’t confirmed such), using “PH PENTHOUSE WEST HOLLYWOOD” in its profile image. So, perhaps, the defendants have simply been given some time to remove references to the marks at issue, which certainly is not uncommon in a settlement agreement. Like most things, time will tell – We’ll just have to wait and see whether the working website and “PH” logo will remain, or whether they’ll be ripped down, leaving only a distant memory in the questioning minds of us watching.